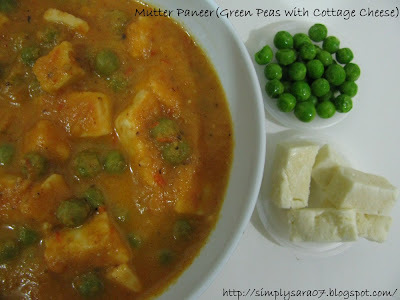 Mutter Paneer is a very delicious gravy/sidedish. 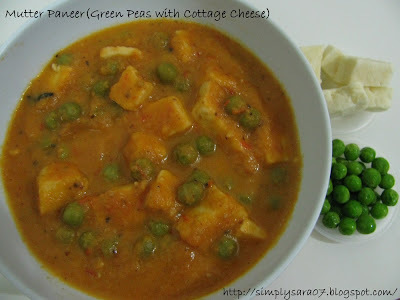 Its cooked with Green Peas, Cottage Cheese cubes with spices. Its an North Indian dish. Hope you all enjoy this recipe. Ghee 1 tspn for taste. In a Kadai/pan, put little oil and fry paneer till brown and keep aside. In the same Kadai, put little oil and spices and saute onion and tomato till its soft. Allow it to cool and grind to a fine paste. In the same Kadai, put little ghee, oil, spices and fry for a minute. Add onion and tomato paste with little water. Add salt to taste. Keep it in low flame. Keep Stirring. Once its cooked well, add green peas, garam masala and red chilli powder mix well. Keep it in low flame. Add curds and mix. Once its boiled, check for salt and add paneer and mix well. Allow it to boil once and off the stove. This recipe is going out for my Say Cheese event with Palak Paneer. Simply Yummy!!!!! love to have it with chapati!!! nice and rich gravy.easy to make also. I can almost feel the succulent paneer pieces meting in my mouth!! Looks absolutely fab! !